This flavorful soup is only 129 calories a serving. And you probably already have all the ingredients you need in your kitchen. are one of the healthiest foods around, packed with lycopene, fiber, and vitamin C.
This incredibly fresh-tasting, flavorful soup fits the bill. At only 129 calories a serving, it’s incredibly slimming. 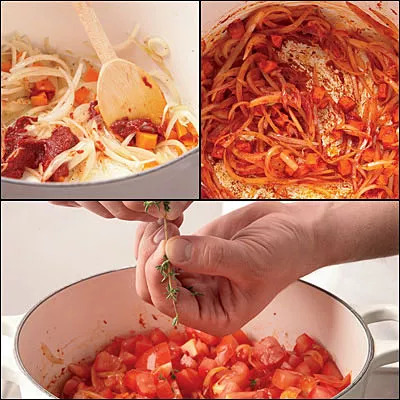 Best of all you probably already have all the ingredients you need in your kitchen: olive oil, onions,carrot, salt and pepper, tomato paste, sprig fresh thyme, tomatoes, sugar, basil leaves. There's no need to peel the tomatoes; tomato skins intensify the flavor of the soup. If you don't want big pieces of skin in your bowl, cut the tomatoes into small pieces. You can puree this soup smooth, or you can make it extra hearty by whipping only half the batch in a blender, then stirring it back into the pot. Oh, if Tomato Soup is not your thing, we’ve got 61 healthy soups and stews on Pinterest. 1. Put the oil in a large pot over medium heat. When it's hot, add the onion and carrot, sprinkle with salt and pepper, and cook, stirring, until the vegetables begin to soften (3-5 minutes). Add the tomato paste, lower the heat a bit, and continue to cook, stirring to coat the vegetables with the paste, until the paste begins to darken--don't let it burn (1-2 minutes). 2. Strip the thyme leaves from the stem and add them to the pot along with the tomatoes. Cook, stirring occasionally, until the tomatoes break down (10-15 minutes). Add 2 cups of the water or juice and bring to a boil, then adjust the heat so that the mixture bubbles gently. Let cook until the flavors meld (5 more minutes). 3. Taste and adjust the seasoning; if the soup tastes flat (but salty enough), stir in the sugar. If it's too thick, add more water, 1/4 cup at a time. If it's too thin, cook until it thickens and reduces slightly (this will also intensify the flavors). Garnish with basil, if using, and serve. Hearty Tomato Soup: Add 1/2 cup white rice, bulgur, or couscous with the water in Step 2, along with 1 more cup liquid. Cook until the grain is tender (5-15 minutes) and be prepared to add a little more water if the soup gets too thick. Spiced Tomato Soup: Instead of the fresh thyme and basil, add 1 TBSP curry or chili powder or 1 tsp smoked paprika (pimentón) along with the tomato paste in Step 1.